His pick-up line was so clear that it became a fitting lead-in to several other clear lines that would be drawn that day: I was on my way to an exhibit titled “Disney and Dali: Architects of the Imagination,” which explores the friendship, artistic parallels, and collaboration between Walt Disney, the iconic American cartoonist, animator and film producer, and Salvador Dalí, the famous, and famously complex, Surrealist Catalán artist. Wandering through the exhibit, I came across storyboards and other drawings for a film which Disney and Dalí had worked on together, from 1945-46 – an animated short called Destino. Disney once referred to the film, the exhibit noted, as “a simple boy-meets-girl love story,” while the clock-obsessed Dalí pronounced it “a magical exposition of life in the labyrinth of time.” Labyrinth of time indeed: the film didn’t get made until 2003. Walt Disney chose not to finance it after all; his studio was nearly bankrupt after World War II, and Destino seemed less commercially viable than the studio’s other projects. 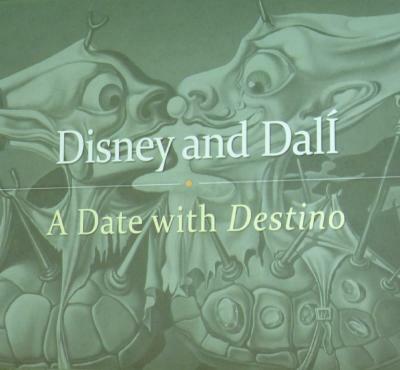 I had the chance to watch this brief, beautiful film – an abstract love story told through ethereal images, and through the lyrics of the accompanying song “Destino” – during a special presentation at the Museum by guest curator Ted Nicolaou, and by David Bossert, a producer, creative director, and Head of Classic Projects at Disney. Mr. Bossert mentioned that one of Disney’s animators introduced to the studio a “clean line” style. The term struck me as intensely reminiscent of the “Clear Line” style developed by the Belgian artist Hergé (the pen name of Georges Remi), who created the beloved comic-book character Tintin, and who developed what would become his signature “ligne claire” technique (“one tries to eliminate everything that’s graphically redundant, to stylize as much as possible, to choose the line that’s most expressive," Hergé explained once in an interview). Though there was never an artistic collaboration between Disney and Hergé, these two influential innovators knew well each other’s work. As Mr. Bossert mused, everyone observed everyone. And this is how it should be. It has always surprised me to witness, among some emerging writers, a reluctance to read books by professional writers working in the same genre, for fear of losing their own developing style. Studying the work of masters is precisely what allows us to both expand and deepen our knowledge of the possibilities open to us, whether we are creating a highly complex work or a basic boy-meets-girl love story. As to my own boy-meets-girl tale, I haven’t called yet the number handed to me in the bus. Nor have I tossed that slip of paper away. It’s good to know that the world is filled with possibilities.